Cuts and scrapes on your skin require the attention of a Band-Aid to help them heal properly. Band-Aids can do a world of good in those situations. However, you’d never consider using a Band-Aid to aid in the healing process of a broken bone or inner organ problem. In more serious situations, more serious measures must be taken for proper healing to occur. The same concept is true of masonry repair work. If you notice a crack or falling walls in your home or business, a simple cosmetic “Band-Aid” is not enough. In order to properly “heal” or fix your problems with your masonry work it requires a three- step process. First, Anglin’s Masonry experts will come out and inspect and diagnose what caused the crack or falling wall. 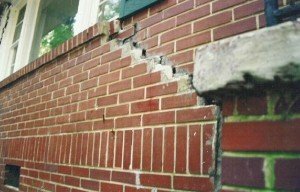 Second, our brick and foundation experts will come out and fix the underlying cause of your structural or foundational issues. We will offer you a permanent solution to your problem to ensure this will not happen again. Third, we will fix the unsightly cracks or fallen walls so they can regain their visual integrity again. If you consider your foundational and brick problems as you would an injury, you could consider our masonry experts as masonry doctors! We diagnose, subscribe a ‘healing process’ and conduct the necessary procedures to return your home to a healthy, safe and happy place to live! Contact Anglin’s today. We are a real game changer when it comes to the structural integrity of your home.